The secret to the success of some companies is risk aversion. That may be the case for Martelli, the 87-year-old Tuscan pasta maker that for most of its existence has only produced four types of noodle: spaghettini, spaghetti, penne classiche and maccheroni di Toscana. 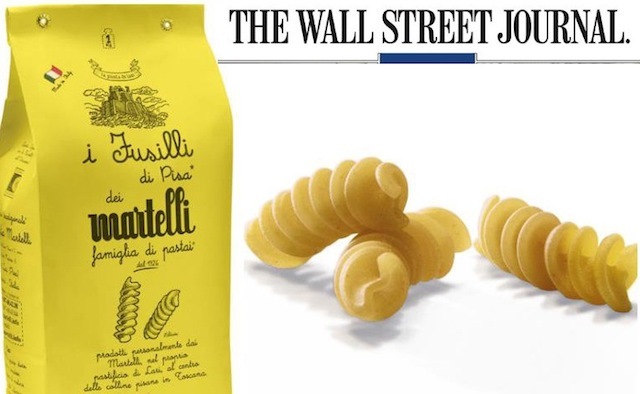 Less than a year ago, the grandchildren of founder Guido Martelli conspired to shake things up with the introduction of fusilli, the company’s first new shape in decades. Granddaughter and part-owner of the family-run business Chiara Martelli said it is an homage to the tower of Pisa, which, like the pasta, bears a signature corkscrew twist. Made at a small factory in the hilltown of Lari, the fusilli are fashioned from cold water and Italian-grown durum wheat. The dough is first extruded through bronze dies, a technique resulting in a rough texture that invites sauces to cling, and is then air-dried for days, accounting for the pasta’s satisfying chew and bready fragrance. This is an article that Gabriella Gershenson wrote for the week end section of the WSJ, July 27-28 2013. It’s also linked here. But I wanted to copy the whole thing because it is beautiful and it really touches your heart. The Martelli family just emailed me and said “parlare così dei Fusilli di Pisa, ci ha fatto veramente piacere”. Meaning that Gabriella was able to capture the soul of their pasta, their family, their pastificio, culture and tradition. All Guido’s grandchildren (Chiara, Lorenzo, Laura and Luca) send a big thank you to Gabriella. And we do, too.